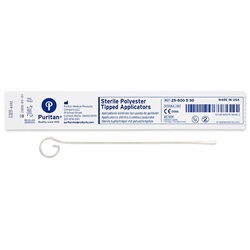 Polyester Tipped Applicators - Puritan Sterile 5.5"
Sterile polyester small tipped aluminum applicators that measure 5.5" in length. Used for specimen collection for testing and screening. Manufactured by Puritan. Comes 1 per pack and 500 packs per box.